Good. Size: 17 to 19 cm tall (12mo); 187 pages 1st class post to the UK, Airmail worldwide. Robust packaging. Fine. 0007157150 ALL BOOKS SHIPPED WITHIN 1 DAY OF PURCHASE! The first book of C. S. Lewis's science fiction trilogy is still unique. I recently re-read this version for the first time in many years. While I was struck by how different the story would be, if Lewis lived and wrote today, the story itself needs no changing. Good is still good and evil is still evil; not much has changed there. We are still moved by things we do not understand, too often to irrational fear-driven actions. And we still have choices to make that impact the course of our lives, as well as the lives around us. Be patient with this book, and you will find a good story therein. Lewis's Space trilogy is a brilliant work, richly imaginative, a gripping story with deep themes. I rank it with Lord of the Rings as a must-read. This is one of C.S. Lewis' lesser known, but no less amazing works. Its a philosophical, psychological, theological, and scientific work of fiction. Those who loved Narnia will love this book. Not as well known as Narnia and for an older age group but just as good an adventure with a stirring message for humanity. You share every step of Ransom's journey and can't wait to turn the page to find out what happens next. At the end of the book you end up with a deeper appreciation of good and evil and the state of the human soul. I put off reading this book for a very long time and I regretted doing so almost as soon as I'd begun reading it. It's a complete breath of fresh air (the age of this story defies belief). Lewis' writing style is flowing, his ideas timeless and his delivery both profound and universal. However `Out of Silent Planet' is by no means a perfect story. This is a short book, close to a novella in length, which is very useful if you're concerned that perhaps the material won't be to your liking. But while I appreciated the brevity, which allowed for good pacing, I would have preferred more character development, especially in regards to the protagonist who is given only the most basic attributes. There's no real sense of Ransom as a person- he's purely the `everyman'- reacting as most people would in his situation, which obviously has its advantages, but struck me as a hesitancy on the author's part to provide him with any distinguishing features. He seemed to me to be less of a person and more of a walking, talking story-telling device, the vehicle for an idea, one designed to entice as large a readership as possible into Lewis's science-fiction themes. Consequently, Ransom never shows very much emotion, even at the untimely demise of one of his closest newly made companions on Malacandra. So rather than a character-driven adventure, the end result is instead an analytical and well-plotted exploration of classic science-fiction themes and is a story that often sacrifices warmth and intimacy between characters for grand themes and logical thought progressions. 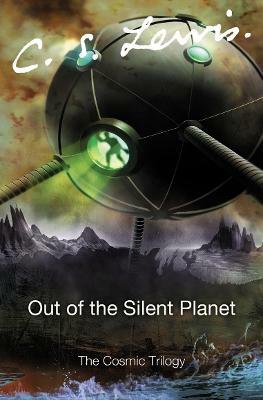 But the story works, there's no doubt about it- `Out of the Silent Planet' is a truly compelling tale and one that I heartily recommend. With so many examples of fiction treating aliens as nothing more than the off-worlders next door, it's really refreshing for a story to explore how exactly a human being would react to the first-hand experience of meeting the member of another species in the flesh, to invalidate all our imaginative assumptions, all our vague wonderings and lofty expectations, and to reward readers with creatures wholly outside our species' realm of experience. At times confusing, but consistently thought-provoking, inherently flawed, but impressively timeless.